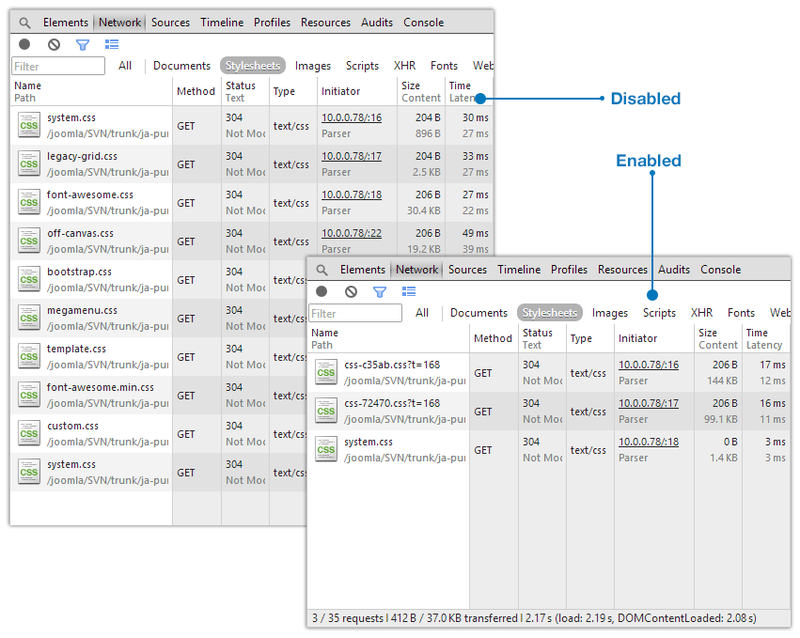 The optimization feature is to improve your site performance. The feature is applied for CSS and JS. When the option is enabled, it will join and compress CSS and JS files. 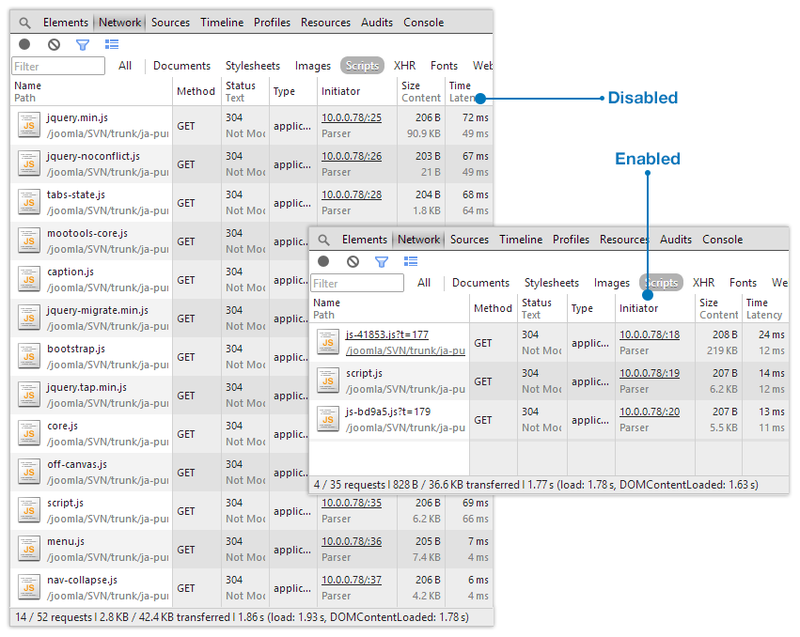 When user view a page, instead of loading all CSS and JS files, it will load the optimized CSS and JS file only. To enable this feature, please turn off the development mode in General tab in any purity template style back-end setting. Now enable options: Optimize CSS and Optimize JS. For JS optimization, we provide 2 tools to compress: Closure Compiler and JSMIN. The Closure compiler has better compress and more accurate but it limit the size of optimization group (under 200kb). You can exclude CSS and JS files that you don't want to optimize, just add the file name, if you have many files, please saperate them with comma. If you have 2 same files, please add full path to the files to distinguish. All the optimized CSS are located in templates/purity_iii/t3-assets/css folder and the optimized JS files are located in templates/purity_iii/t3-assets/js. How optimized files are generated? When the optimization option is enabled, the optimized CSS and JS files will be auto generated when a page is viewed in the first time. If there is any change in the CSS, JS loaded in a page, new optimized JS and CSS files will be auto gererated again. So to prevent from having a lot of optimized CSS and JS files, you should check before turn the Optimization option on. In Purity III, there are 2 ways to create masthead for any menu item. 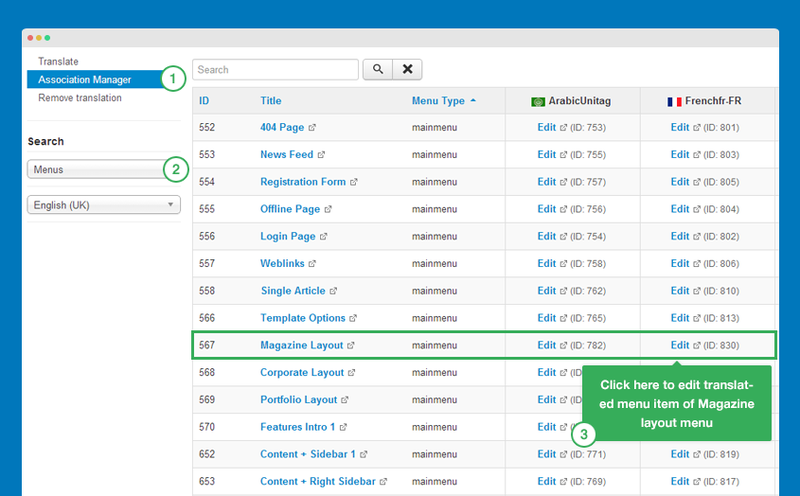 In menu setting panel, we add extra fields that allow you to add masthead for the menu item. 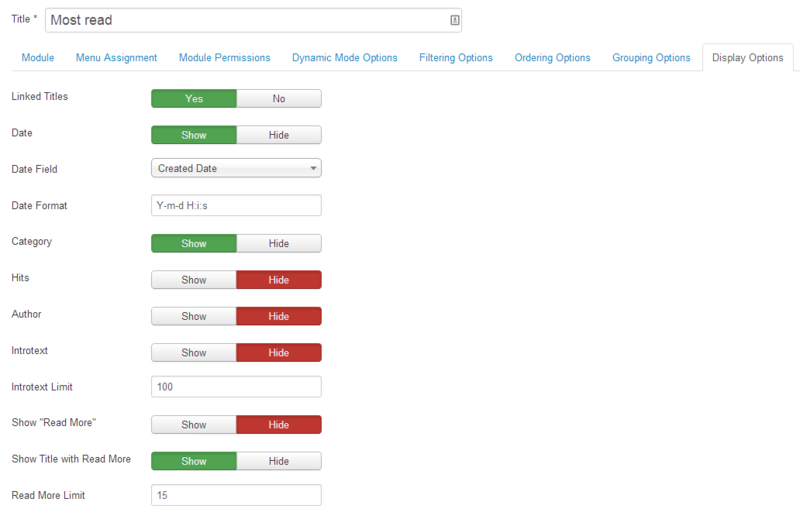 Then extra fields are in Page Display tab. 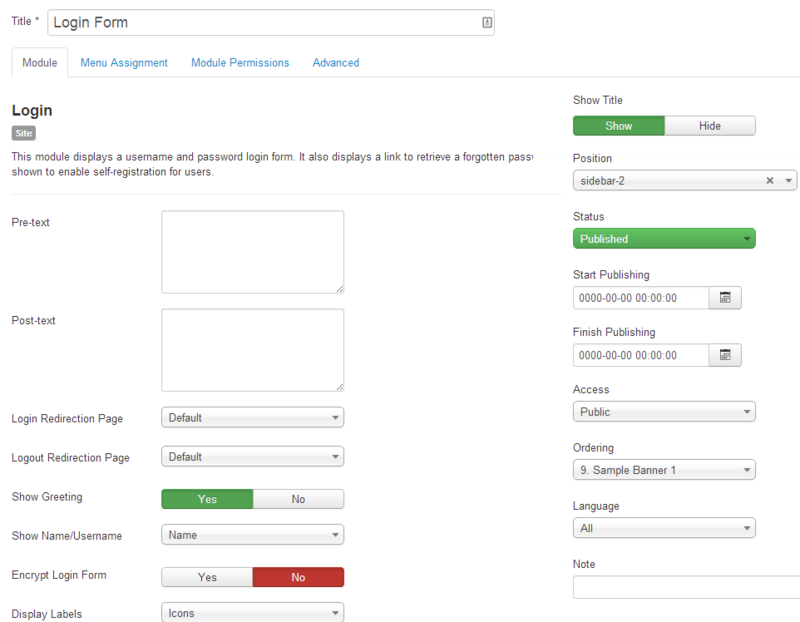 You can customize style of masthead, you can find the style of masthead in .less file in templates/purity_iii/less. By default, position masthead is enabled in all layouts. If you want to display masthead in any specific page, create a module, add content to the module, assign to position masthead. Normally, we use Custom HTML module so that we can add content flexiblely. Assign the module to the page you want to display in. Add class to style for the module. 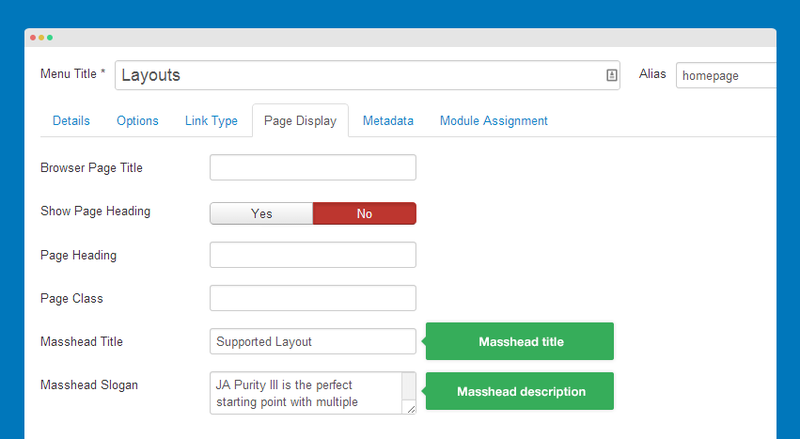 In Purity demo, modules in masthead position use class row-feature-primary, the class is to set background color for masthead. In conclusion, if you just want to use simple masthead with title and description, you should use extra fields in menu setting. 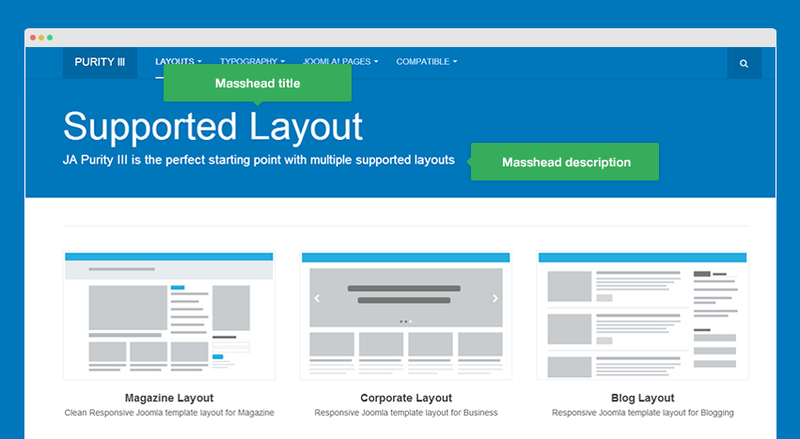 If you want to have flexible content in masthead, you can select to use masthead position. For every web master, Google analytics is a must-have tool. The installation of Google analytics now is so easy with the suppport of T3 framework. Sign in to your Analytics account, and go to the admin page. 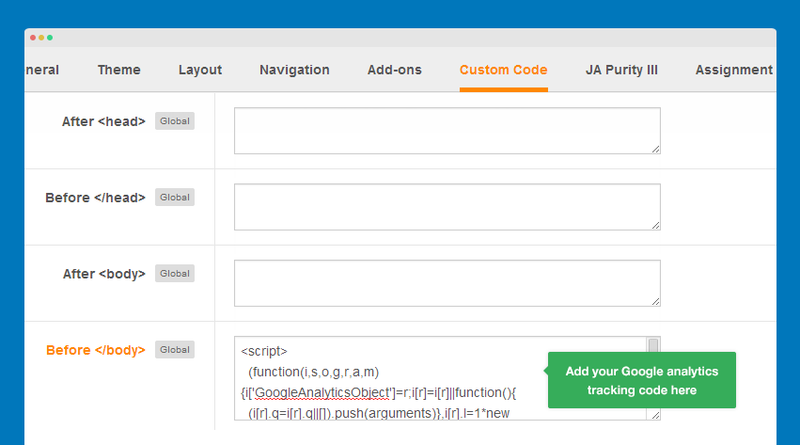 When you have Google analytics tracking code, open any Purity III template style, go to Custom code tab then add your Google analytics tracking code to the field Before. You can add the scripts to any template style, as this is global settings. An other way to add Google analytics tracking code to your site is adding the code before closing tag in the header.php file in templates/purity_iii/tpls/blocks. 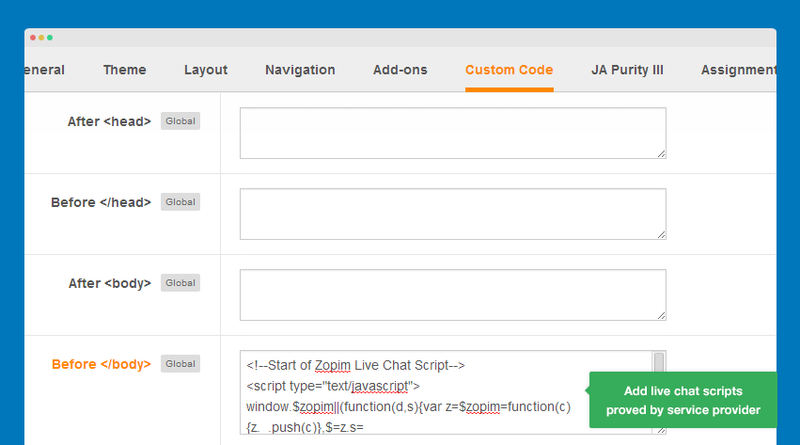 Normally, when you use a Live chat service, the provider will give scripts to add to your site. 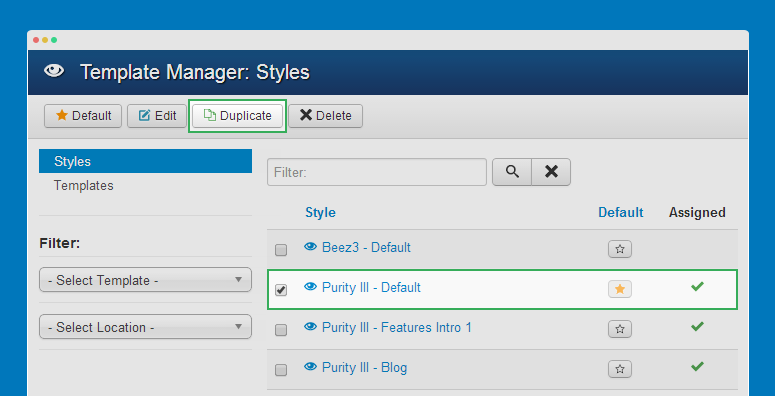 Instead of adding the scripts to file, you now can paste the scripts to the Purity III template style back-end setting. 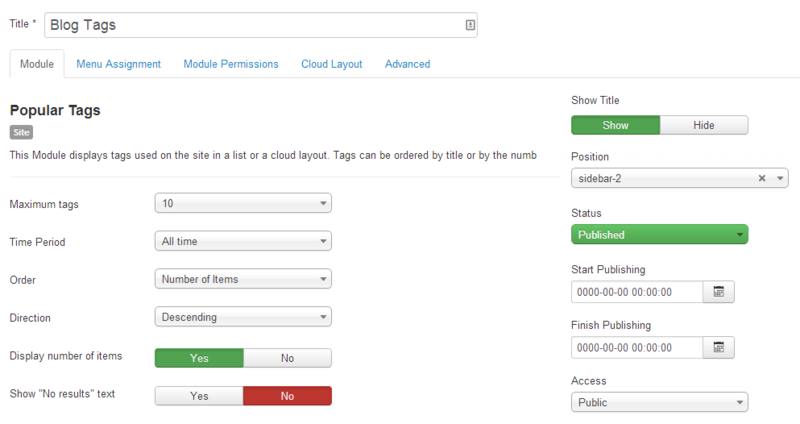 Open any Purity III template style, go to Custom code tab then add live chat to correct field. Purity III use font awesome 2 and font awesome 3 font. If you want to use other font, you can add. If you want to use Google fonts, you just need to difine the google fonts you want to use in the asset.xml in templates/purity_iii/etc. 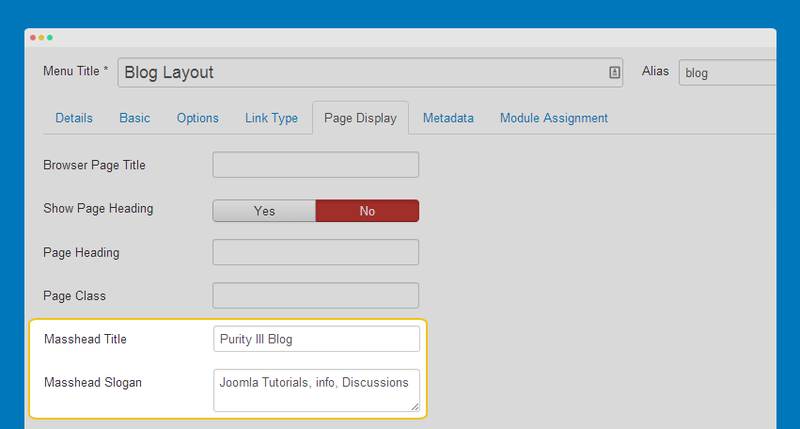 The section includes configuration of modules used in Purity III demo: default Joomla modules and Custom HTML module. To have same tabs as in our demo, please follow the instructions. 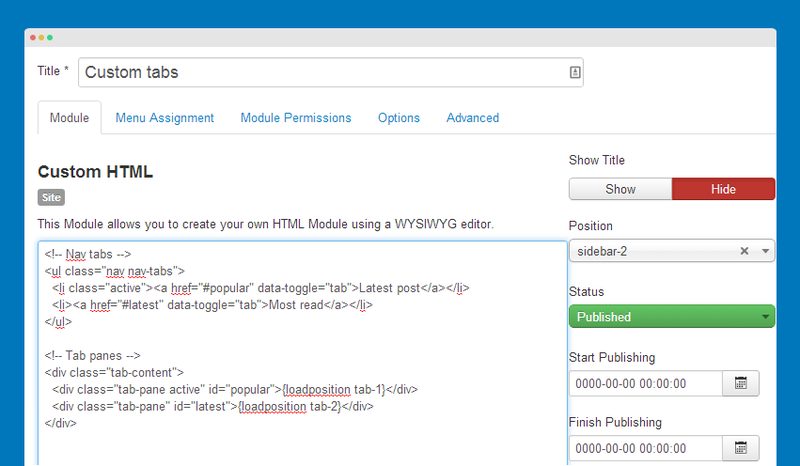 Step 3: create Custom HTML module to define "Most Read" and "Popular post" modules in tab. You can enable masthead for any menu. 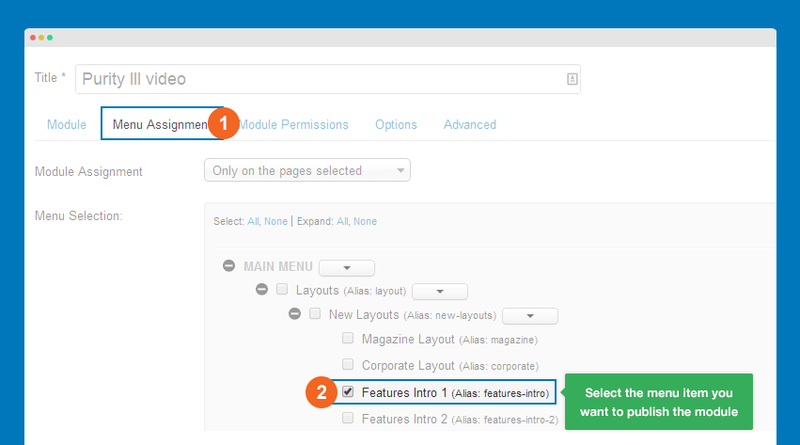 In the menu setting, go to Page Display tab to add Masthead title and Masthead Slogan. 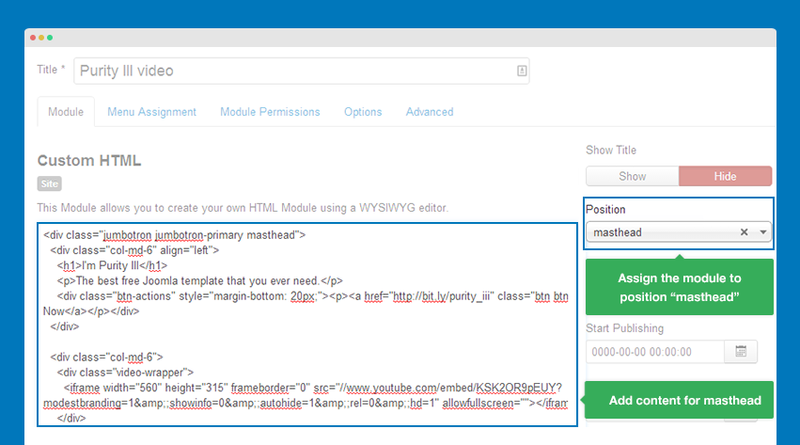 Looking for Custom HTML module on Features Intro layout 2? Check it out now. The setup process can be varied depending on your site's development status. 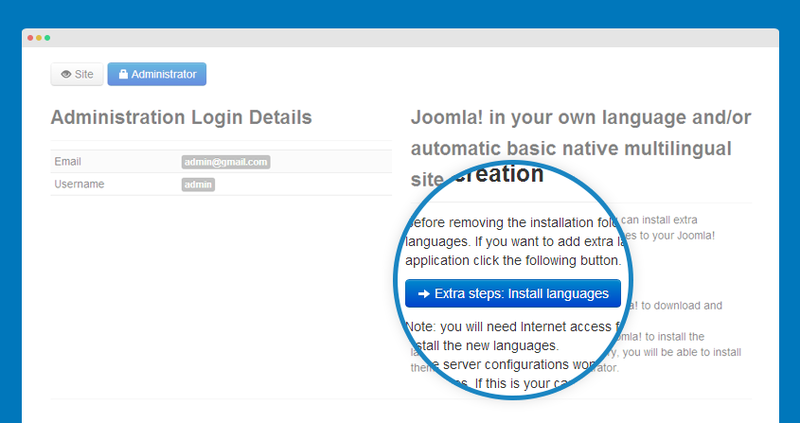 1: Enable "Extra step: Install language"
Your site is now multilingual, the next step is creating "Language switcher" module. 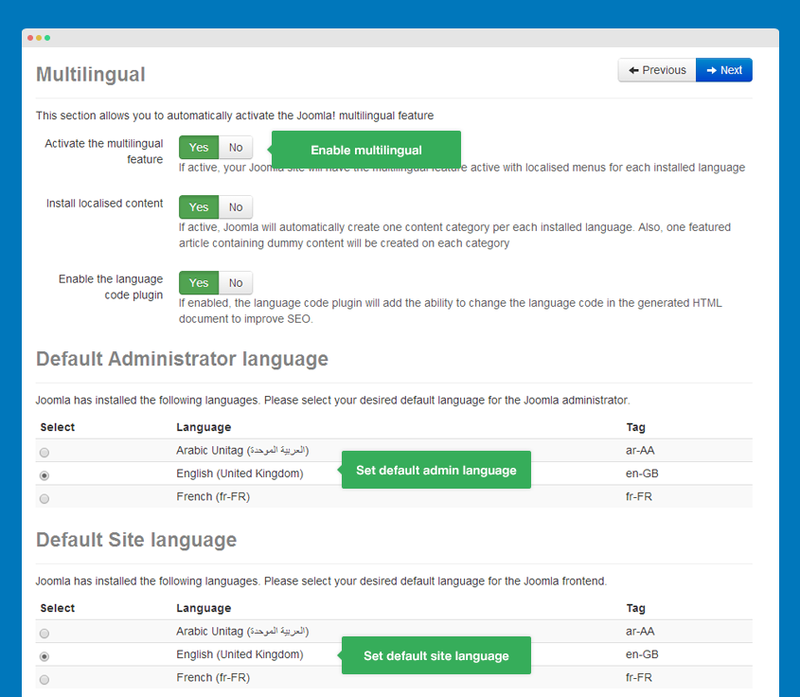 From version 2.5, it's now easier to build a multilingual site without seeking help from third party extension. 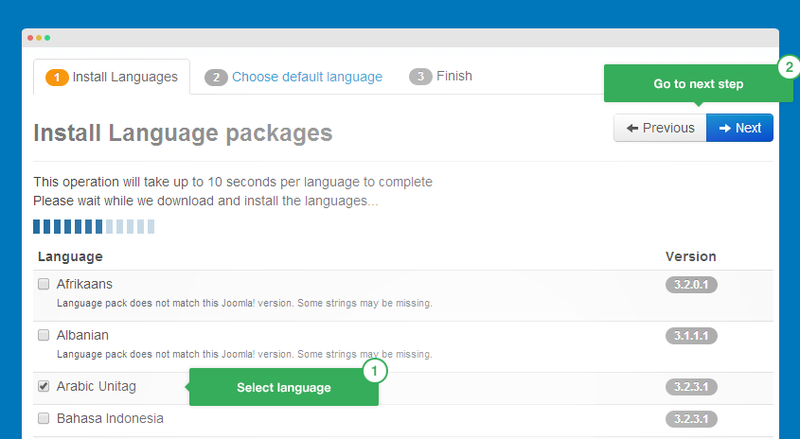 There are 2 possible ways to build up a multilingual site: manual setup or auto setup with JA Multilingual Component. It's up to you to go either way. In this tutorial, we will show you step-by-step to build a multilingual site with JA Multilingual component, the free Joomla extension not only helps setting up a multilingual site for you, it also translates all content in your site: articles, menus, modules, third party extensions, event metadata, saving you A LOT of time! 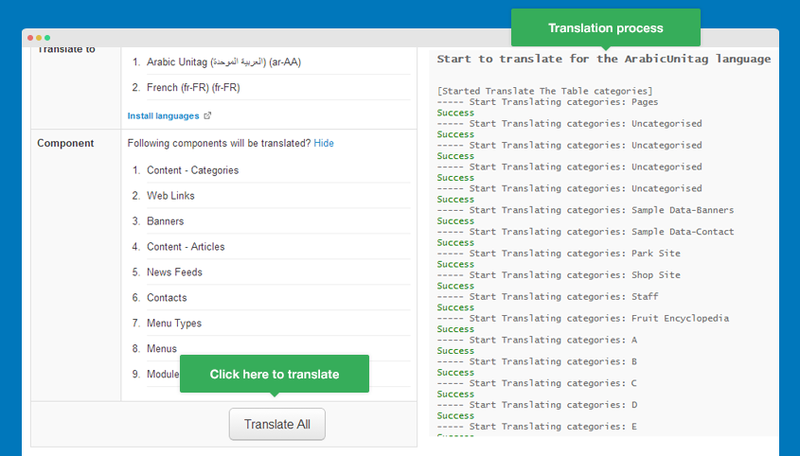 The component currently supports 2 translation services: BING and Google. What you need is registering BING API or Google API, add the info to the configuration of the component. Click on "Install language" then select languages you would like to install. Click on "Translate All" to translate all installed languages. You can check the translation process on the right pannel. After the installation is done, your site is now multilingual. 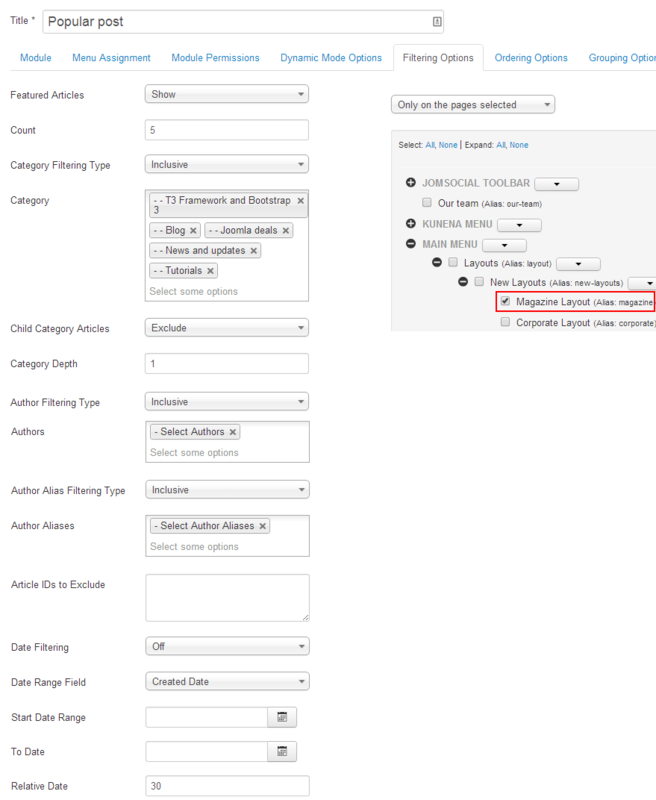 To manage association or to edit content, the best place to do that is the "Association Manager" panel. 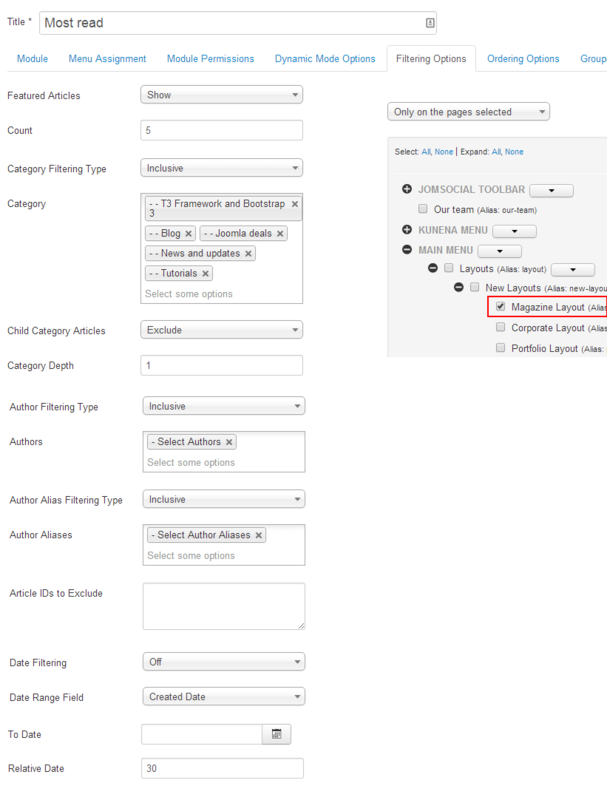 You can also use manual setup as Joomla default supports. 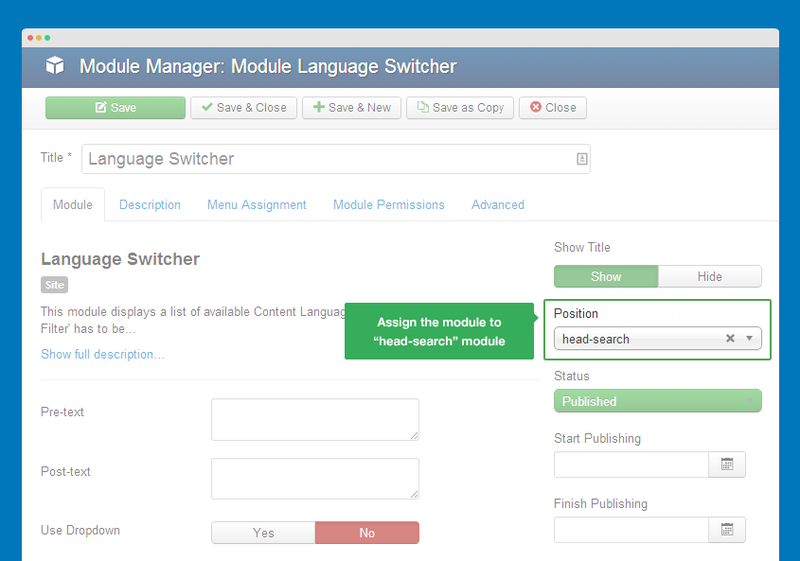 The module allow users to switch languages in your site. Please assign the module to position "head-sear" and to all menu items. You can leave other setting as default. By default, when you publish the module in the "head-search", it does not look as nice as you might like, so you might need to custom its style a bit. To custom style, add style to any .less file in your template LESS folder (templates/purity_iii/less). 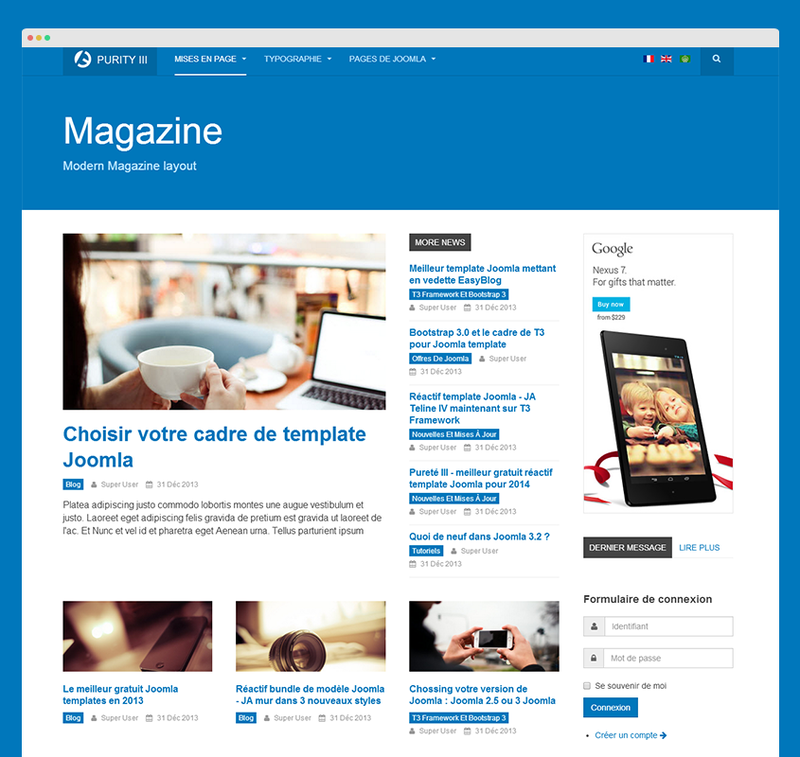 For default Joomla layouts, it works fine but for override layouts (Magazine, xBlog, Portfolio, Feature Intro 1, Feature intro 2, Corporate, Glossary), we need to configure its menu. All override layouts in Purity III get content from a category. What we have to do is assign correct category for translated menu items that use override layouts. 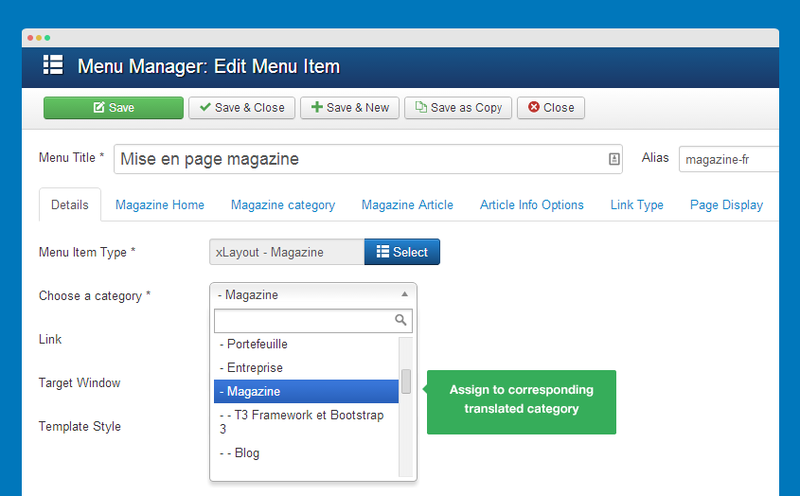 Go to: Components >> JA Multilingual >> Association manager, then select Menu content type. Assign to corresponding translated category for the menu item. Do the same for other menu items that use override layouts. We're done, let's see the front-page. 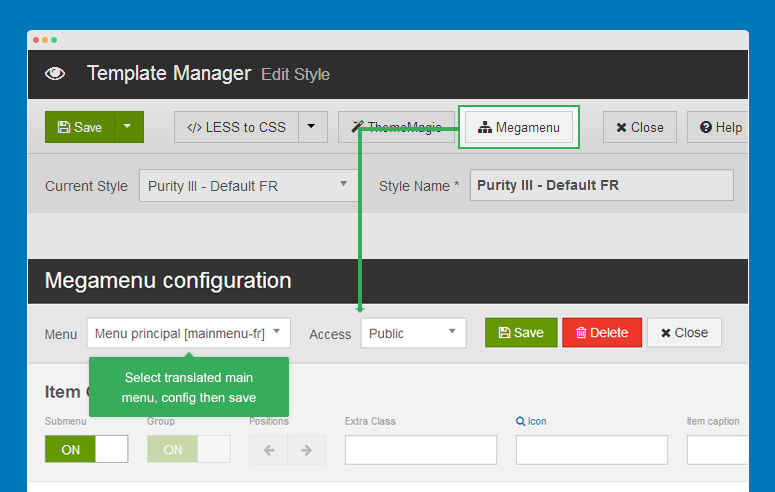 Megamenu will work fine with your multilingual site without any configuration/customization. If you select to build your multilingual site manually, you need to follow the instruction to make your megamenu work in multilingual site. In this tutorial, we enable megamenu for French langauge. Select Purity III default template style then hit "Duplicate" button. 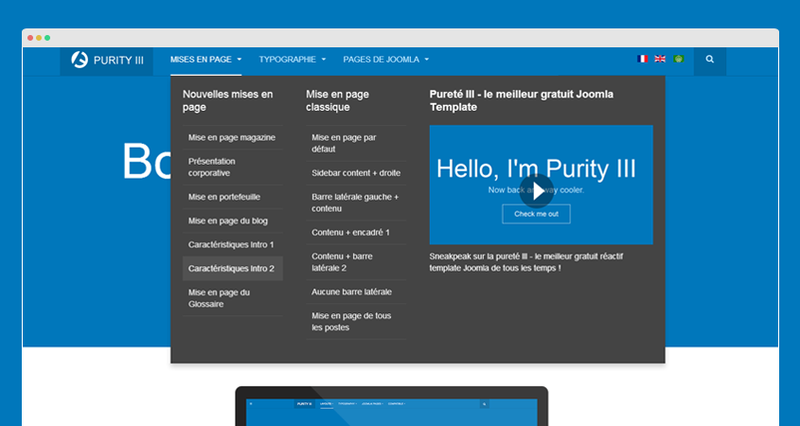 Assign translated menu (the menu that will be displayed as main menu for the French language). 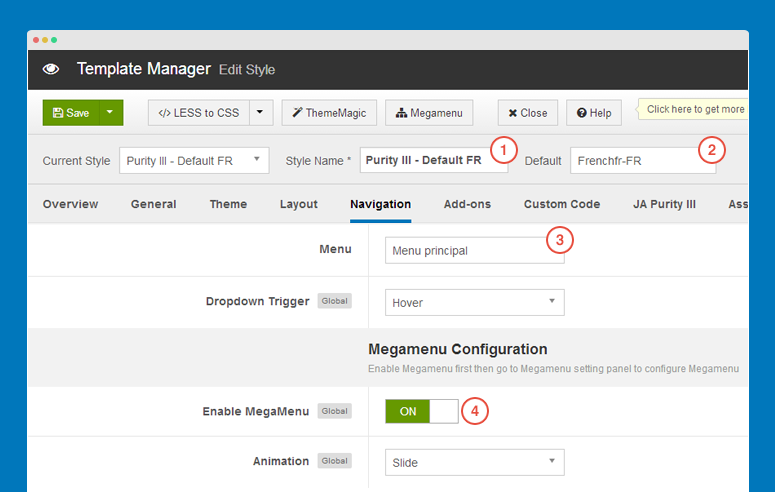 Open Megamenu configuration pannel by clicking on the "Megamenu" button on the top options bar. By default, it will load the selected menu that you assigned. After configure megamenu, please keep in mind to save its settings. You should save megamenu settings even you don't change anything, this will help to render and make megamenu work in French language.